TVGuide.ca: Now that you’ve had a few hours for it to sink in, how does it feel to be $500,000 richer? Hayden Moss: It feels great. I still don’t think it has sunk in yet. It hasn’t really hit me. I can’t explain how good it feels. TVG: It obviously worked, but what was your thinking behind bringing Lane over Enzo? At the time, did you think Enzo really had a shot at winning over you? HM: Yeah, I thought Enzo would beat me. I thought for sure Rachel and Brendon would vote for Enzo over me, and then he only needed two more votes and it could have been anyone, so yeah — I thought he would beat me. TVG: Were you shocked by how close it was? HM: Yes, I was. Brendon and Rachel all season long said that they were going to vote for the best competitor and then they changed their minds and went with the best social player. So yes, I was shocked. TVG: What was your strategy going into the game? HM: I wanted to make friends with the stronger competitors and work a chick, too — that was Kristen. I didn’t want a showmance, though. It just kind of happened. TVG: What do you think were this season’s biggest game-changers? HM: The Brigade turning on Matt was huge. That probably made the game for me. TVG: What were you more shocked to learn — that Lane was going to bring Britney to the final, that Matt lied about his wife being sick, or that Ragan was the second saboteur? HM: That Ragan was the second saboteur. I knew Matt was sneaky and I had an idea that there was more to [him] than what met the eye. Enzo and I both knew that Lane was in deep with Britney. I guess we just didn’t how deep. TVG: If Kristen had stayed in the game, would you have brought her to the finals? You can confess now … you’ve already won. HM: I would have probably taken a Brigade member. I would have done what was best for me. TVG: OK, so Matt believes 100 per cent that he came up with the Brigade … but so does Enzo. ‘Fess up — whose idea was this crazy alliance? HM: They came up with it together, but Enzo named us so I’m going to go with Enzo. TVG: If you hadn’t won the last HoH and Lane brought Enzo to the finals with him, who would you have voted for? HM: I think I would have voted for Lane. They both played a good social game, but Lane has won more competitions and been more competitive. TVG: Finally, what are you going to do with the money? Dance lessons? HM: I’m going to invest, pay off student loans and snowboard a lot. I haven’t put too much thought into it yet. Um, the chick who runs the show is really fat! Am I doing it right? Oh well, maybe next year. 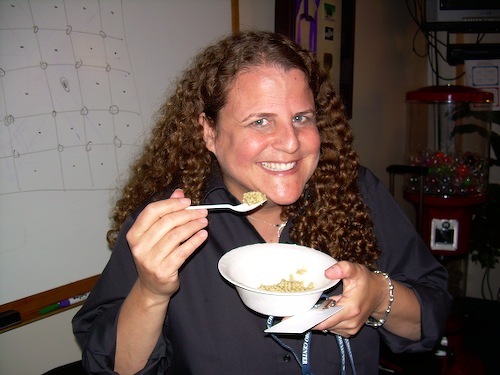 Did youhear they had to cancel the BB after party in Vegas because Allison Grodner ate all the shrimp cocktail, caviar, prime rib, and other food when she got a whiff of it all? I’m glad that I’ve started an OnlineBigBrother legacy that’s just as large as Allison Grodner is! What a party. A bunch of family and some has beens from previous BB shows. Enzo is embarrassing himself thinking he’s going to be some big star. Do they not realize Hollywood hates reality show contestants? The union despises them, so good luck getting on the good side of any A list actors. Bet you that the money will be gone in a year. I doubt that. Hayden seems like he has a good head of his shoulder. If not, mom is going to be there to give him good financial advice, I’m sure. He’s close to his mom, so I don’t think he’ll end up hiding somewhere, and using that money to hit the pipe. FYI Hayden said that himself! Simon, will you have a chance to interview them yourself? Some of the bloggers conduct interviews on other reality blogs I read for other non-CBS programs, for example Project Runway. And it doesn’t matter if the blogger says mean things about the contestants — the contestants still often are interviewed! Brit and the fire on TMZ: http://www.tmz.com/2010/09/19/big-brother-britney-haynes-arkansas-house-fire-repairs-prize-money-nfl-career/ Although TMZ undercounts her $$, she has 25 (AC), 10 (comp) and stipend = approx. 47gs before taxes. I feel sorry about her fire but happy that she HAS the $$$ to more than compensate for what she lost. And it sounds like she won’t have to worry about breaking a lease :) for her move to LA. She needs to stop sponging for donations and sympathy. For real. That’s almost like the welfare mentality. Give me, help me. FAREWELL, I WILL MISS BB. SURVIVOR IS GOOD BUT ONLY ON ONCE A WEEK. Simon and Dawg…………you guys did a great job again this year ! See ya’ next July !